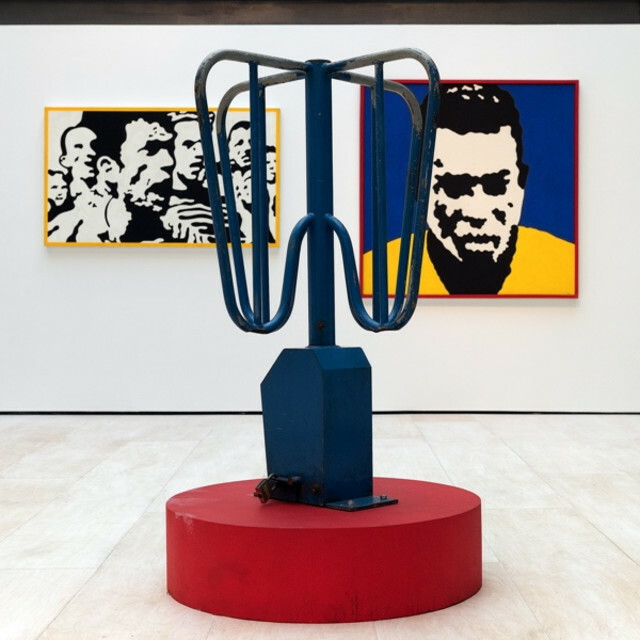 Claudio Tozzi: New Figuration and The Rise of Pop Art 1967 – 1971 focuses on the first solo exhibition of this important Brazilian artist in the United Kingdom. Claudio Tozzi’s work shines a particular light on the politics of Pop Art in the late 1960s and early 1970s in Brazil. While at the University of Sao Paulo, Claudio Tozzi met critic and physicist Mário Schenberg, who quickly identified his work with Brazilian new figuration, a contemporary alternative to the Concrete Avant-Gardes. Tozzi’s interest in figuration developed from a necessity of working with his social and political reality. The photographs he took were processed in a photographic laboratory trying to obtain high contrasted images that were later cut out, assembled and juxtaposed. Moreover, as the photographic images of newspapers or magazines were blown up, the individual dots of granulation became apparent. This made way for thinking about the paintings as reticules, and using colour and composition to exacerbate the disintegration and, new integration, of the image. These individual dots remind us not only of Roy Lichtenstein but also of the German Sigmar Polke and his dual focus on how images are mediated and disseminated alongside a silent critique of bourgeoise consumer culture and cold war politics.